Full Disclosure: Coinbase design allows for mass, targeted phishing of its users. I'd like to start by saying that, I have tried my best to get these bugs fixed, and that I mean no harm by posting this, but rather wish to inform Coinbase users. I often come accross security issues which have been introduced "by design" and in many cases, developers of web applications refuse to fix these design flaws. I feel strongly, that this is the case in my recent findings for Coinbase. I spent hours trying to communicate my findings to Coinbase. Initially, Coinbase ignored me. My succession of emails to their official "[email protected]" domain were ignored until I posted that they weren't replying on reddit. Still as of now, my tweets to them over a months time were completely ignored: , , , , . #1 Feb 28th, 2014 - First contact made to "[email protected]". #3 Mar 4th, 2014 - Second contact made to "[email protected]" due to no reply. #6 Mar 16, 2014 - Third contact made to "[email protected]".. still no reply. #8 Mar 24, 2014 - Reddit posts on /r/bitcoin and /r/coinbase. #9 Mar 25, 2014 - Email reply received from Julian from Coinbase. #10 Mar 26, 2014 - My response, explaining that Julian had missed the main part of the vulnerability disclosure. 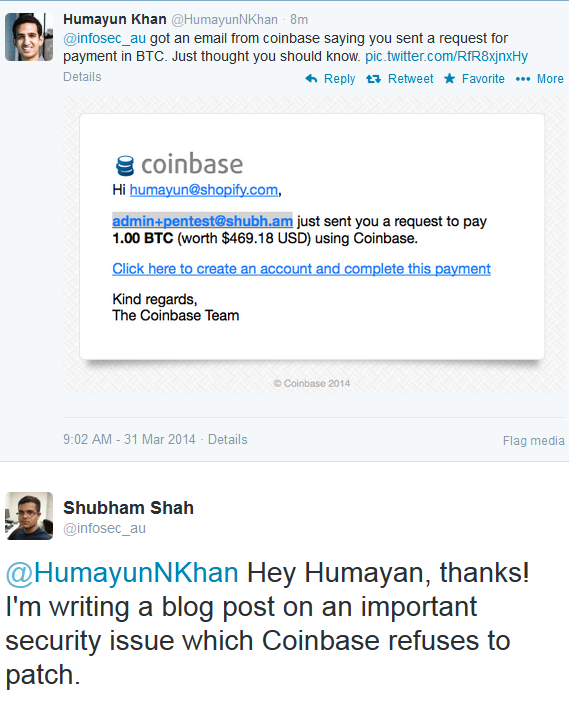 #11 Mar 29, 2014 - Coinbase joins HackerOne bug bounty management platform. #12 Mar 30, 2014 - I send another report via HackerOne to make sure they have acknowledged the full risks of the design flaw. #13 Mar 31, 2014 - Confirmation as a "wont-fix" bug. Here are the emails to and from Coinbase. I'll cut to the important parts of my report in this blog post, however feel free to read the entire report. In my report, I claim that the ability to send unlimited money requests allows for an individual to determine whether or not a user is a part of Coinbase, as well as his/her first and last name listed on Coinbase. The major security flaw, is not just the fact that full names are disclosed, but more so that there is no rate limiting or prevention of API abuse. This means that an attacker/spammer can iterate through hundreds and thousands of emails without being limited, and can potentially pick out the emails which are confirmed to be members of Coinbase. Before you get the impression that this isn't a security flaw in itself, please let me explain. Phishers can use this flaw for harm. I believe it is a security issue on Coinbase, which will merely assist mass, targeted phishing. where [emailtheywishtovalidate] in the POST Data would be changed to the victims email, and the Cookie HTTP header would be filled out with the attackers cookie. The response which Coinbase returns, will determine whether or not the requested email address is valid. The email we requested is valid on Coinbase, as a user exists. The email we requested is associated with the name John Citizen on Coinbase. Phew, now the spammer has taken scraped email addresses, and now has figured out that you're a valid user of coinbase AND now has your full name. 1. 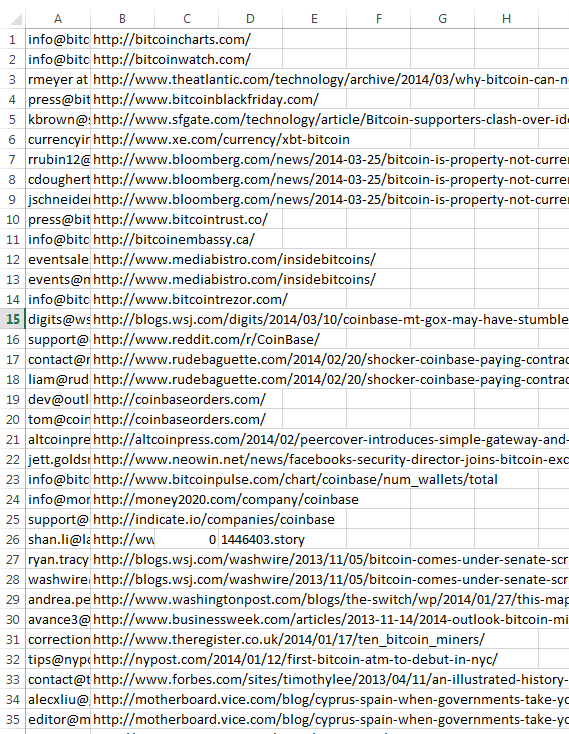 Scrape email addresses from bitcoin related websites, and organise them into a large list. 2. Test for emails which are actual Coinbase accounts, and extract their First and Last names, associated to the emails. 3. All sorts of panic happens. 4. You get valid results (Coinbase user enumeration). 5. People start thinking that Coinbase emails, are no longer legitimate/are unsolicited. 6. 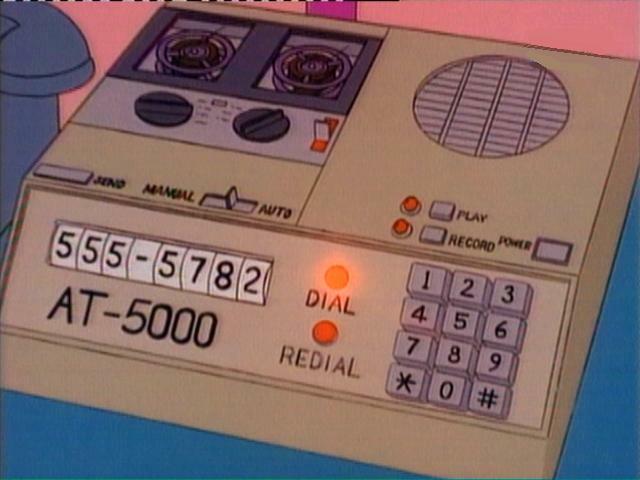 Some people think you're sending them Bitcoins. 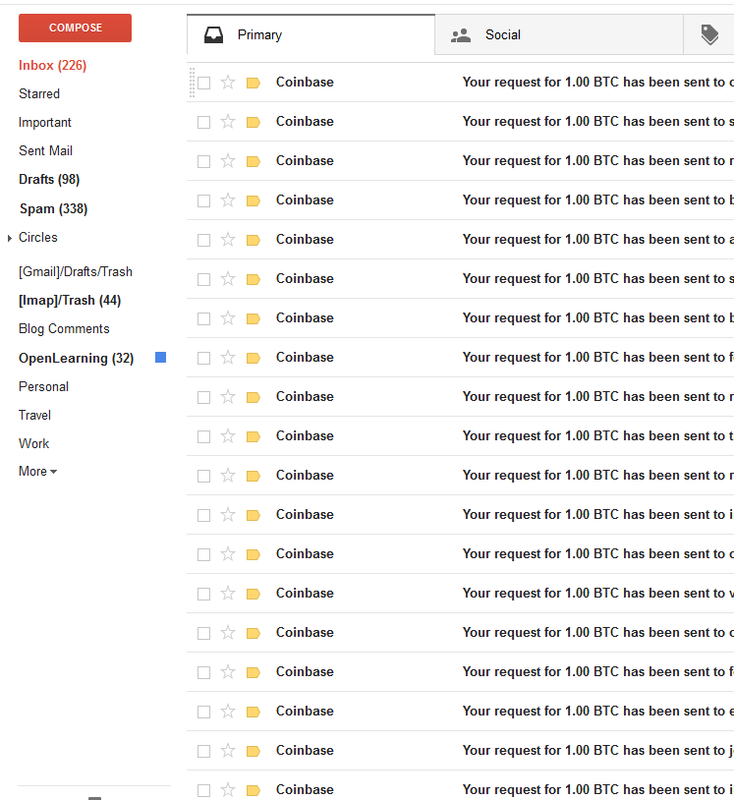 Seriously, Coinbase let me send 16 pages worth of Bitcoin requests. Help get this bug fixed!